Day 13 – From Big to Bigger… the Big Easy! Our drive through Houston was quick, really just a stop on the way to New Orleans, however we got the feeling that our view of the city was just the tip of the iceberg. We didn’t get to explore even half of the recommended spots in Houston but what we DID do was really cool. The city was spread out and hard to navigate as first timers but the vibe there was really mellow and unassuming. 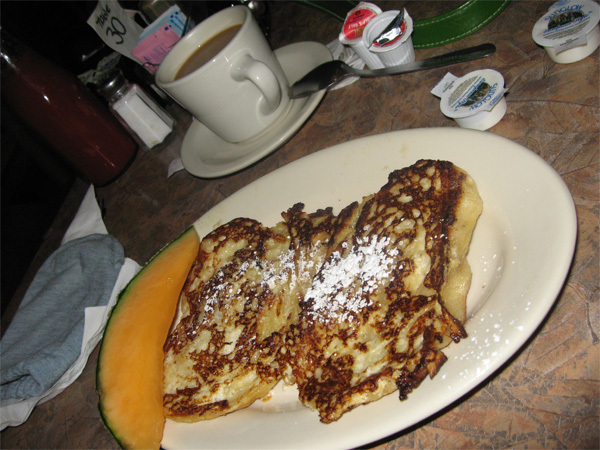 Before we left the BIG state of Texas we went to Breakfast at Java Java Cafe in the Heights and had a little meal to fuel us up for the road. Dennis had croissant French toast and I had the Avacado Benedict with grits. 5.5 hours to New Orleans. We found that the drive is much more pleasant when you take the byways and not the highways. They’re really beautiful and full of charm plus that’s where the good eatin’ joints seem to be located. 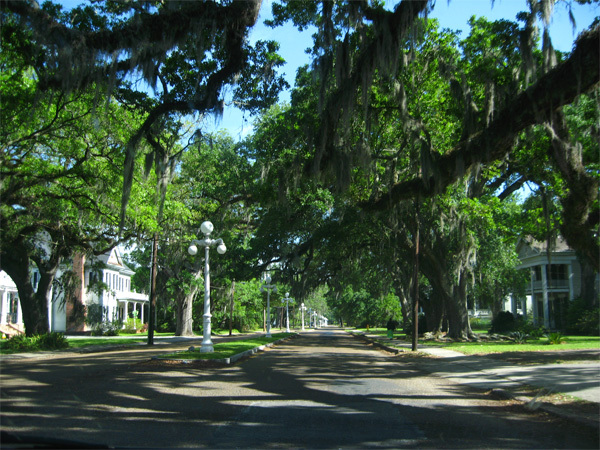 As soon as we crossed the state line into Louisiana the landscape changed, the moss gracefully hung from the tree-lined route along the scenic 182 . Wetlands flanked both sides of the drive. We passed over bridges of all sorts and by graveyards and plantation style houses complete with columns and shutters galore. We stopped in Lafayette for lunch at The Country Kitchen. 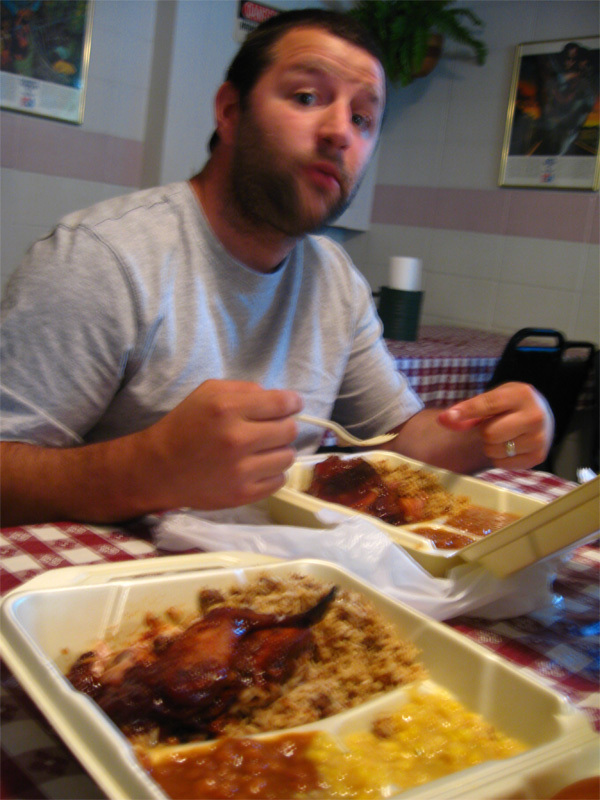 It was yet another cafeteria style eatery serving the basics; BBQ and all the fixin’s. Even though it was a casual place, it was easy to feel under dressed because it was right after church hour and all the folks coming in were in their Sunday best. However we did fit in with the plastic table coverings and the spray painted coffee cans that held a roll of paper towels on each table. Dennis got the BBQ beef brisket and I got BBQ chicken. More Yummy bbq, but we’re going to make it the last for a few days… BBQ OD! On the road again… through more wetlands and in between towns like Franklin, LA which are dotted with old street lights and withering, forgotten main streets. 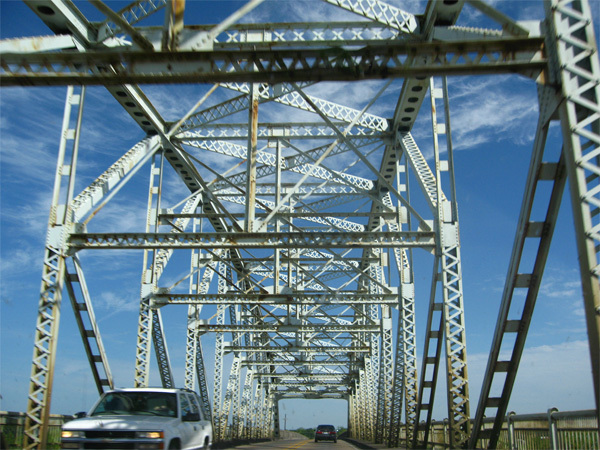 Then we hit the big one… the Mississippi River! We’ve arrived in the Big Easy! The weather is warm but very temperate and beautiful at night. 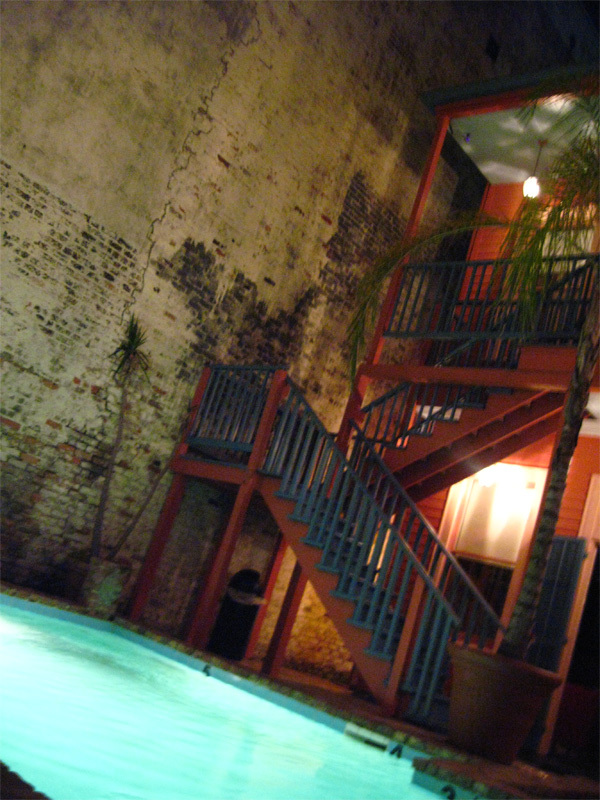 The hotel is located in the Faubourg Marigany area which is “down river” from the French Quarter by about 4 blocks. Frenchmen Street is the beginning of this area which stretches east about 9 more blocks. Frenchmen Street is full of bars and restaurants and live music on any given night. The info we’re read so far says this is the locals scene, either way it’s a bit more mellow here that in the tourist-filled French Quarter hotels. Oh and as far as the city’s condition, you can tell it’s been through a storm or two in it’s lifetime but what little bits we’ve seen have been okay. There is plenty of character and a some potential for future restoration. It’s Sunday and there are plenty of people on the streets, all kinds young and old. We walked to and from the French Quarter and up and down a few streets which are all well lit so we can gander at the beautiful french and spanish architecture with the dripping plants and wrought iron railings. The full moon is out and the city is comfortably alive. i sure love those old houses with the pillors. have lots of fun for me too. i miss you and elvis too.